The new iPad is already the must-have tablet for technology aficionados these days, and while many would argue that it is also the best looking tablet on the market, others would possibly wish for something a little more eye catching. If eye catching is what you are looking for, then look no further than this modified iPad which, apparently, something of a world’s first. 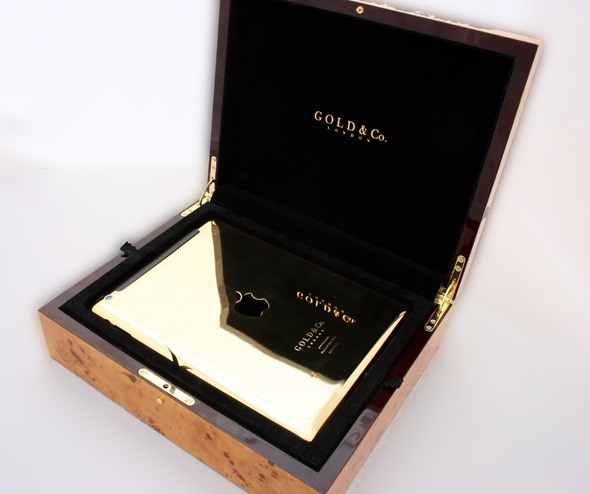 If we were to say that the iPad is being offered by London firm Gold & Co., then you may be able to work out where this is headed, but if not, allow us to spell it out for you: this is the world’s first 24ct gold iPad. 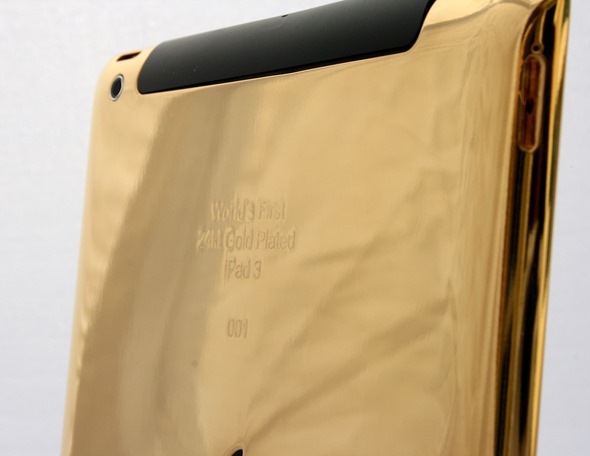 The gold plated iPad has been on show at the Damas jewelers store in Dubai Mall, which just happens to be the world’s largest mall, and is to be auctioned off for charity. If you do want one, they are available for order too, with a 64GB 4G iPad set to run $5,499. 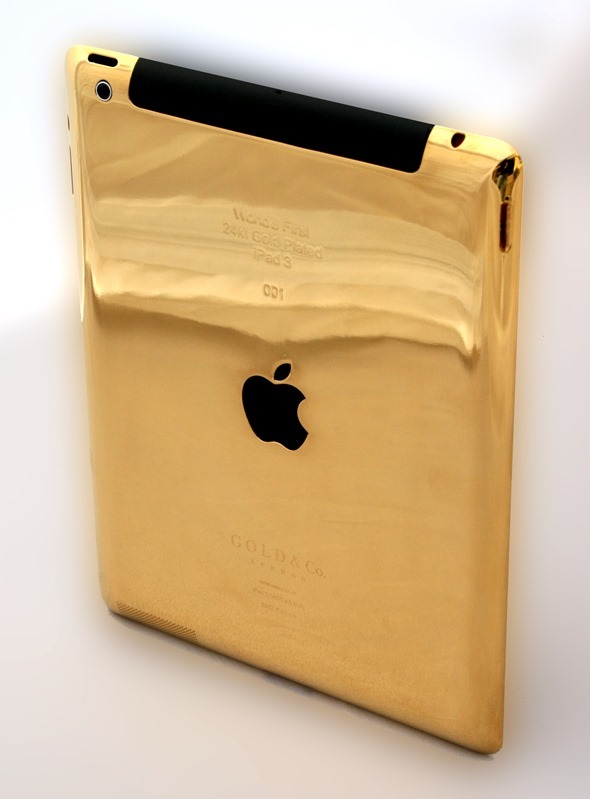 That’ll get you the top of the range iPad, plated in 24ct gold. A bargain, we are sure you’ll agree. We’ve ordered two whilst writing this. If the iPad isn’t your cup of tea, and you fancy something a little more portable, then Gold & Co. also has a couple of smartphones on offer. The company is taking orders for a 64GB iPhone 4S at $4,349 and a BlackBerry 9900 for $2,449. All products come in a luxury wooden box, too, according to the company’s press release. If you are worried that having a 24ct iPhone or iPad isn’t going to be exclusive enough, then rest assured, for the items will be individually numbered and limited to just 250 units of each per year, per region. 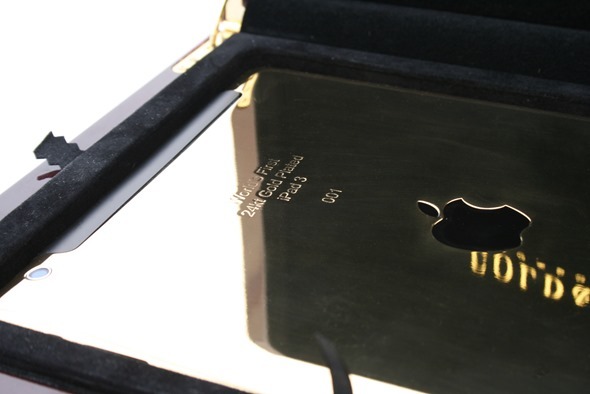 We suspect the chances of you running into someone toting the same gold-plated iPhone as you, are rather slim. Even more so that BlackBerry 9900, but that’s for a completely different reason! What we will say is this: if you are going to splash the cash on something as luxurious as a gold-plated iPhone, iPad or BlackBerry, for the love of God make sure it’s insured! You wouldn’t want to drop that little beauty down the toilet!